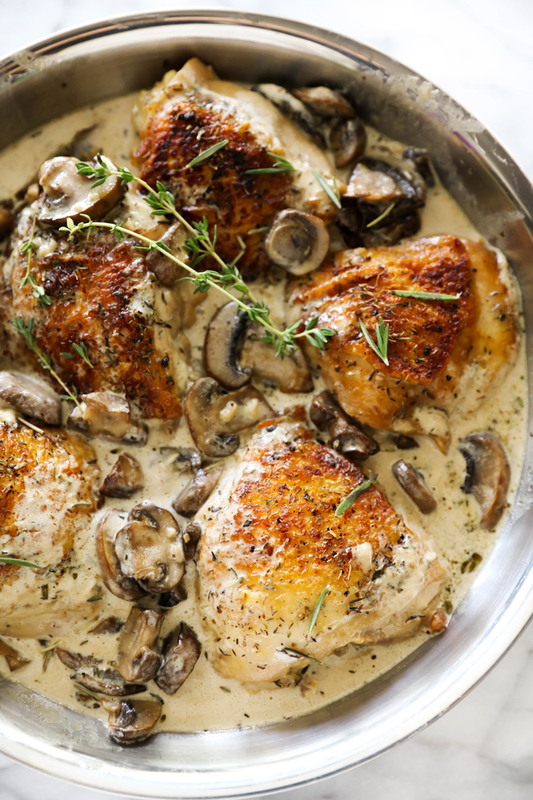 This Creamy Garlic Herb Chicken is rich and flavorful and makes a fantastic main dish. The cream sauce contains garlic and a variety of herbs that combine deliciously. The mushrooms really add something spectacular to the meal. This will be a recipe that will become a new regular. Heat large skillet over medium high heat. Add olive oil and chicken. If using boned chicken cook chicken for 8 minutes per side. Wipe skillet clean with a paper towel. Melt butter over medium high heat and add mushrooms. Add garlic, thyme, rosemary, salt and pepper and cook for another minute. Add chicken broth and heavy cream and bring to a boil. Lower heat to medium low and add chicken back in. Cook for about 20 minutes. Chicken should reach and internal temperature of 165 degrees F.